Grief is a journey that none of us want to take, and yet nearly all of us will find ourselves having to navigate it at some point in our lives. It’s a journey that we can never quite prepare ourselves for and the path through can often be hard to find, especially as grief is something that many of us find difficult to talk about. 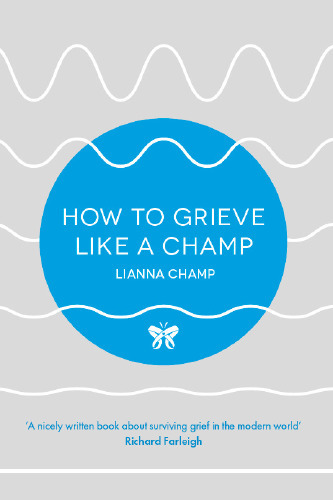 In her book ‘How to Grieve Like a Champ’, Lianna Champ shares some advice on navigating through the journey of grief. The book is divided into fifteen short chapters which cover different types of loss, aspects of grief and the importance of funeral rituals in helping us through the grief journey. I found the short chapters and the way they were divided up to cover specific aspects helpful. It meant I could read snippets of advice here and there rather than needing to concentrate for longer periods of time. Lianna’s advice is based on over 40 years of experience in bereavement and grief recovery. The book mentions Grief Recovery Method®, a programme which helps give grievers the tools needed to journey through loss. The five stages of grief that many people experience (denial, anger, bargaining, depression and acceptance) are discussed whilst acknowledging that everyone’s grief journey is unique rather than a series of stages that should be followed. ‘How to Grieve Like a Champ’ encourages the reader to grieve instinctively, to accept and acknowledge the emotions that come with grief and work through them. It talks about the importance of working through the feelings of grief instead of trying to push them away or hold them back. If those feelings are not acknowledged and worked through, they tend to lead to unresolved grief which then resurfaces at a later point, and there is a chapter which specifically discusses this. Working through my feelings is certainly something that I have found helpful so far in my own grief journey. I have learned to go with the flow and ride the emotions that I am feeling in the current moment rather than feeling like I should be following a process of grief. Lianna suggests that instead of asking someone who is grieving how they are, to ask instead “how are you coping?” “How are you?” is such a difficult question to answer when you are grieving. The answer changes from moment to moment and there is always the temptation to give the easy, expected answer along the lines of “I’m doing okay. Coping. Surviving.” Being asked how I am coping gives me the space to express some of that emotion more clearly without having to unjumble it all in my head. The book also acknowledges the importance of talking about grief and being able to share memories about those we have loved and lost. Giving those who are grieving space to talk without offering advice, changing the subject or trying to relate the experiences shared to our own experiences can be incredibly helpful. Being strong and brave doesn’t mean having to distract oneself from memories and grief; it is also about thinking and talking about our loved ones. Acknowledging our grief is what allows us to heal. There are several chapters covering different types of loss such as the loss of a partner, a parent, a child, a sibling or a colleague. There is also a chapter covering other types of loss such as the breakdown of a relationship or the loss of a pet. I love how the book talks about “moving forward” rather than “moving on”. One of the things that many people (including myself) fear when it comes to acceptance is that this means moving on from our loss and leaving it firmly in the past. Lianna talks about grief being like a tree and memories being the fruit of that tree. She talks about learning to live with loss whilst carrying those we love in our hearts. There will still be moments of pain and tears because these are natural parts of the journey. Acceptance is not about letting go – it’s about moving forward, letting go of negative coping mechanisms and allowing oneself to have moments of joy and happiness without feeling guilty. Like life, grief is a journey and not a destination. How to Grieve Like a Champ is all about learning to navigate that journey. It’s a book that is well worth a read for anyone who is trying to navigate their way through a grief journey or for those who are trying to help a friend or loved one along the way. I was sent a copy of How to Grieve Like a Champ for the purposes of this review. All thoughts and opinions are my own.